If you're turned off by the sound of the sweetness or milkiness of this cocktail, don't be. It's quite harmless. The name Bee's Kiss is apt, because it is only a kiss of honey and cream that makes this drink work. A rum with a bit of character helps as well. 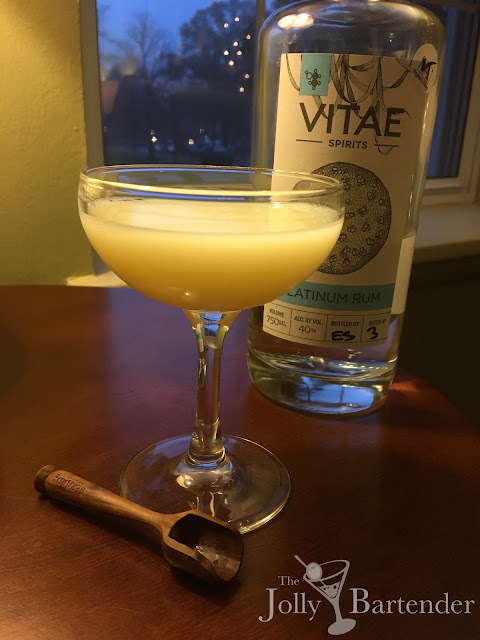 That is why Vitae Platinum rum is used here. You get that soft sugar notes of molasses from Vitae that you won't find in heavily blended white rum. I went for organic honey because you don't know what you're getting these days in the plastic bottles that look like bears. The rest is surprisingly easy.